#3 Missouri was upset by unranked Kansas State for the second time this seas on. This will make my blog about Mizzou a little more difficult later on. They lost 78-68. Rodney McGruder dropped 24 points against the Tigers. Michael Dixon was able to put in 21 points off the bench, and star Marcus Denmon added 19 of his own in the losing effort. Ricardo Ratliffe had 14 rebounds but missed the double-double by 1 point. #8 Georgetown was also upset, but they lost against unranked Seton Hall who they should bea t every day. Senior Jordan Theodore scored 29 points for the Pirates. He shot a perfect 5-for-5 from behind the arc. Not one player on the Hoyas scored in double digits in any column (points, assists, rebounds). 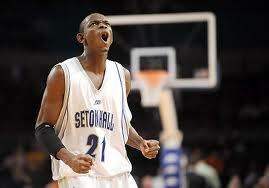 Seton Hall 61% from the field, 61.5% from 3-point range, and 78.9% from the free throw line. Georgetown only recorded 9 assists as a team. Newly ranked #21 New Mexico was upset by rival Colorado State 71-63. 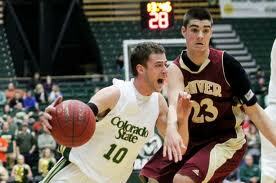 Key players for the Rams were Pierce Hornung (13 pts, 5 rebs) & Dorian Green (17 pts, 8-8 ft). New Mexico’s Kendall Williams (16 pts) & Demetrius Walker (14 pts) each had good games.